A very extensive list of swimming places in the Austin area by Graham Cohen: Austin Area Swimming . We include some of our favorite hot springs here, but there are more comprehensive western hot springs web sites and guide books. Have a look at our Related Links at Hot Springs Links . Several swimming places near Austin. See DIRECTIONS below for details. All directions are from Austin. BARTON CREEK GREENBELT PARK [BARC]: Upstream of Barton Springs is the Barton Creek Greenbelt Park and trail. There are several well used swimming holes in Barton Creek in this linear streamside green belt park. It is a good hike anytime but if you want to swim better get there in the Spring of after some rains as the creek is pretty dry later in the summer. If the flow is good, you can also tube (or even kayak) on this section of creek. 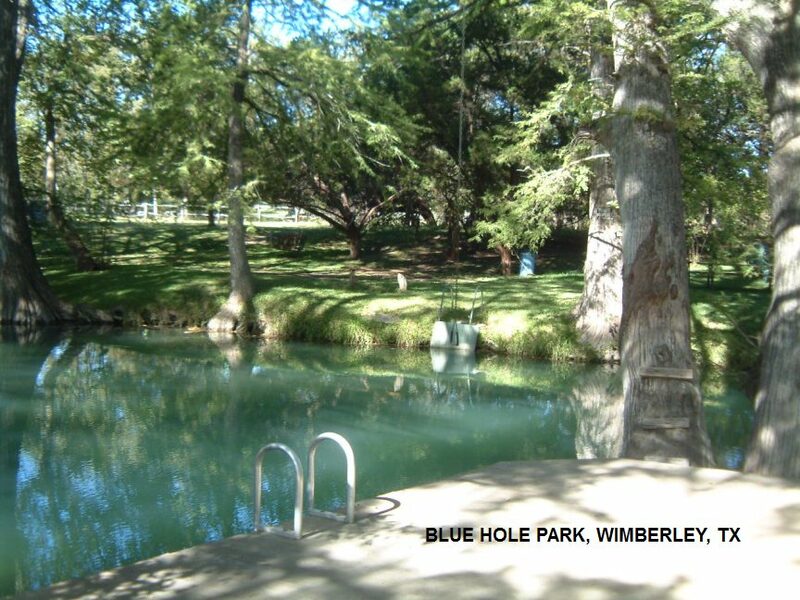 Cambell's Hole & The Flats: Two Great swimming holes for people and dogs alike. Use Spyglass Access point at 1500 Spyglass Dr. at LAT, LON: lat=30.25792, lon=-97.78744(source: map) (accuracy: exact) LINK TO GOOGLE MAP. Gus Fruh Pool: Nice private spot. Use Gus Fruh Park access point at 2642 Barton Hills Dr. at LAT, LON: lat=30.24932, lon=-97.79515(source: map) (accuracy: exact) LINK TO GOOGLE MAP. Kirk\Alvin's Wall: (# 5 on the map linked to above). Jumping place as shown in this YOUTUBE VIDEO . Park at Loop 360 access (see map linked to above) and walk downstream (northeast) down Barton Creek, pass airmans cave and look for the jumping wall on the right hand bank. LAT, LON: lat=30.2420 lon=-97.7924 (source: map) (accuracy: approximate) LINK TO GOOGLE MAP. Twin Falls: Very popular hole. Sculpture Falls: Great pool downstream of falls, pretty secluded spot, hike past Twin Falls. You may see lots of cars parked south of here on the Mopac frontage road. Use Gaines Creek access point at 3900 Frontage Rd. MoPac Expwy (RT 1) at LAT, LON: lat= 30.24411, lon=-97.80984(source: map) (accuracy: exact) LINK TO GOOGLE MAP. 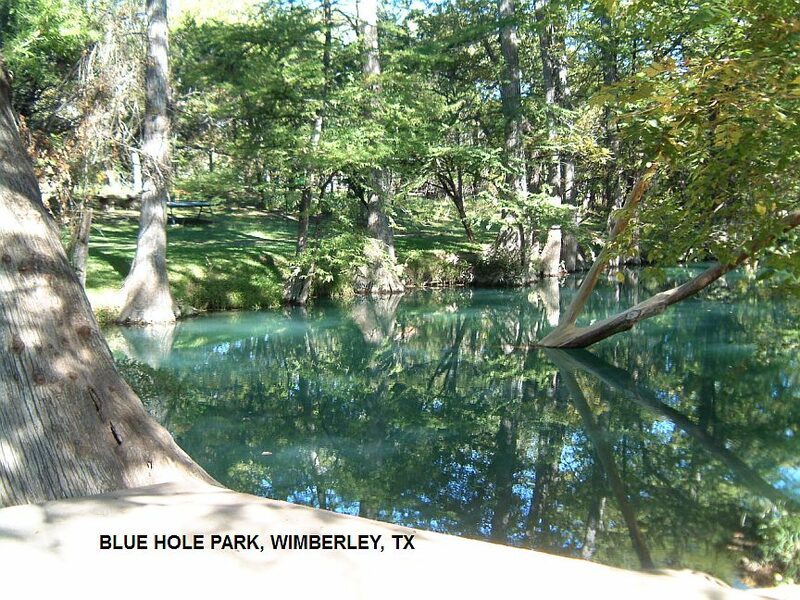 BLUE HOLE GEORGETOWN [BLUG]: Traditional swimming place on the San Gabriel River right in downtown Georgetown. Dams create the pools and there is a cliff to jump from and small rapids to tube and play in. You can swim here and walk into downtown. PHOTO . To get here from Austin, take I-35 north to Georgetown and take Exit 259 and take South Austin Ave. through downtown. At the north end of town, just before you cross the bridge over the South Fork San Gabriel River, turn west (left) on 2nd Street and follow signs to the Blue Hole Park. LAT, LON lat=30.6421, lon=-97.6790(source: measured) (accuracy: exact) LINK TO GOOGLE MAP. Verified, 11/2012. Very confident. Updated 11/2012. 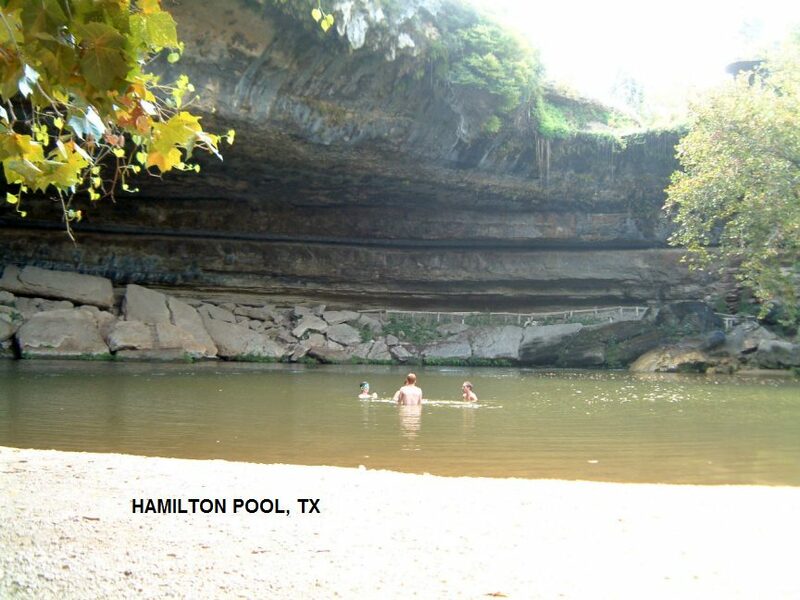 HIPPIE HOLLOW COUNTY PARK [HIPP]: The only officially clothing optional public park in Texas! Park and swimming area on Lake Travis west of Austin. See WEB SITE for all information. Entrance fee, must be 18 or older to get in. About 1/2 hour drive from Austin. Gets crowded on warm summer weekend days - people get turned away once the parking area is full, so get there early. From downtown Austin, take West Koenig Ln west, becomes Allandale Rd then becomes RR Rd 2222. Continue west on RR Rd. 2222, across RT 360, and cross RR Rd. 620. From the intersection of RR 620 and FM 2222, turn south (left) on RR 620 and go 1.3 miles then turn north (right) on Comanche Trail and travel 2 miles. Park entrance is on your left. LAT, LON lat=30.41445, lon=-97.886(source: map) (accuracy: approximate) LINK TO GOOGLE MAP. Verified. Very confident. Updated 5/2011. The park's main attraction is a large (77,053 sq. 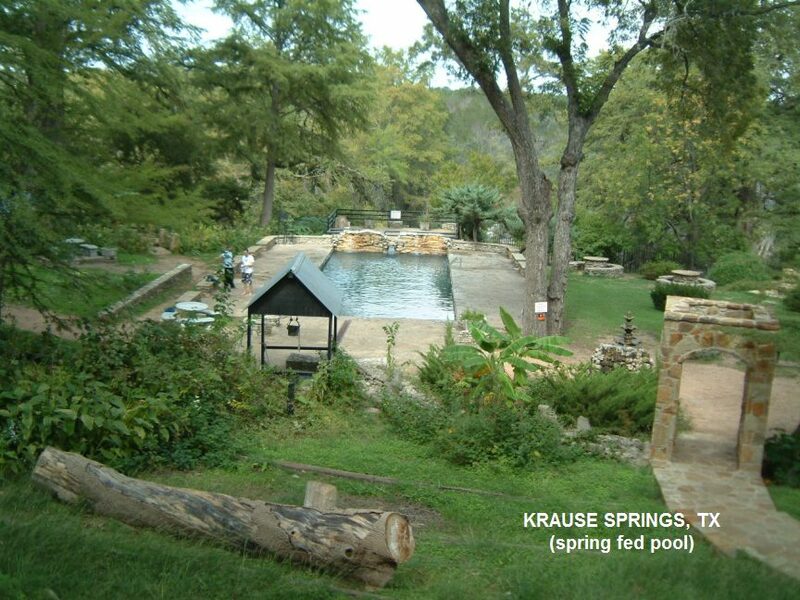 ft.) artesian spring pool that is open daily and fed by San Solomon Springs. The pool differs from most public pools in several respects: the 1 3/4-acre size, the 25-foot depth and the 72 to 76 degree constant temperature. It also has a variety of aquatic life in its clear waters. With a capacity of more than 3 1/2 million gallons, the pool has plenty of room for swimmers, while offering a unique setting for scuba and skin diving. See web site for details: BALMORHEA S. P.
At site, reservations available. There is also a historic "court" - like a motel. From Odessa, take I-20 west then I-10 east. The park is located 4 miles southwest of Balmorhea on State Highway 17, in Toyahvale. Take the Balmorhea exit off I-10 (exit #206); FM 2903 south to Balmorhea; State Highway 17 east 4 miles to the Park. From I-10 eastbound, take Toyahvale/Ft. Davis exit (exit #192); Ranch Road 3078 east approximately 12 miles to the park. lat=30.089, lon=-98.424(source: DeLorme) (accuracy:exact) LINK TO GOOGLE MAP. 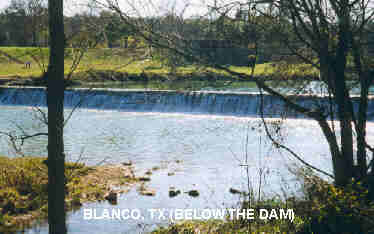 From San Antonio, go about 45 miles north on RT 281 to the town of Blanco. Can't miss the river. Swimming place in town in Boerne Lake Park behind dam. PHOTO . From San Antonio, take I- 10 northwest to Boerne. Go to downtown Boerne to the intersection of Main St. and River Rd.. Turn east on River Road and go a short way to the park on the right hand side. The swimming place is here behind the dam. A commercial waterpark in Fort Worth, offers summer fun for everyone. Burger's Lake is a 30-acre park featuring a one-acre spring-fed lake for swimming. Water chlorinated and filtered. Facility includes: Two sandy beaches for sunning; wonderful big trees for shade, lifeguards, picnic tables, diving boards, a 20-foot slide and 25-foot trapeze. WEB SITE. 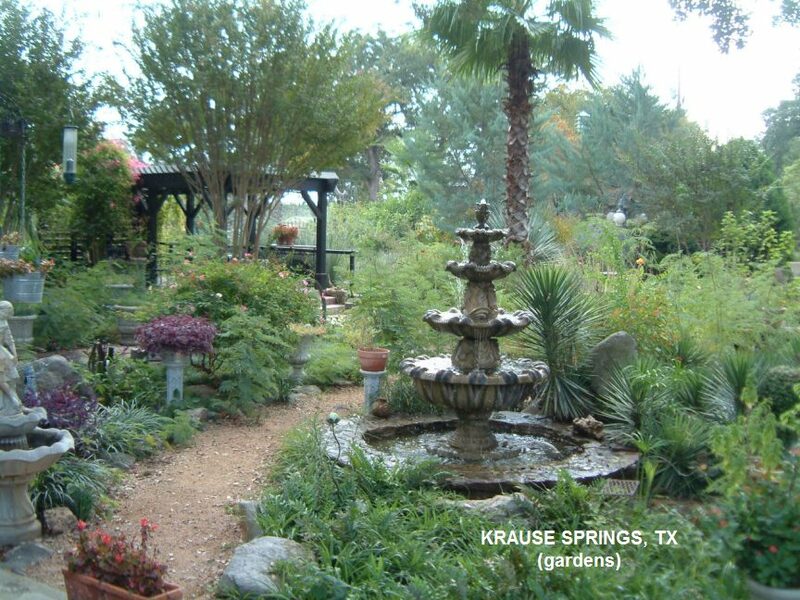 Way out in West Texas - Beautiful commercial hot springs with camping, lodging and food. Day use of springs also (fee). see website. Camping at site, lodging also. From Alpine, take RT 90 west to Marfa then RT 2810 (Pinto Canyon Rd.) south then see map on website for further directions. lat=31.05955, lon=-98.50471(source: DeLorme) (accuracy:general area) LINK TO GOOGLE MAP. Little-known local swimming place in pond. Said to be very clean water. Short walk from road. Don't know much about this place - be very careful - do not go in if it looks unsafe or uninviting. From Gilmer, go southeast on RT 300 about 6 miles then turn south (right) on Grouse Rd.. Follow Grouse Rd. about 1.8 miles to a sharp right hand bend in the road (before Kingfisher Rd.). Park near this bend and look for a yellow "ice on bridge" sign on the north (right) side of the road. Walk straight north into the woods by this sign. (The path may be hard to see). There is a little hill then the pond is right there. Sulfurous apring used to be health resort now a spring fed town pool. All facilities. Has tea room too. From Austin, go north on RT 183 about 60 miles to Lampasas. As you enter Lampasas, Hancock Park and Hancock Springs Pool will be on your left. Several swimming place in parks near Houston. See DIRECTIONS below for details. At Village Creek S. P. and Huntsville S. P. There may be other Texas State Parks in this area with camping. To make camping reservations: Texas State Parks. All directions are from Houston or Beaumont. VILLAGE CREEK S. P. [VILL]: Hike 1 mile in State Park to sandbar swimming area on Village Creek. WEB SITE. Phone: 409-755-7322. Camping. Fee. LAT, LON lat=30.2497, lon=-94.1765(source: DeLorme) (accuracy: approximate) LINK TO GOOGLE MAP. From Beaumont, take RT 69/96 north; take Mitchell Road exit onto Mitchell Road (just before the RT 69/96 split). Go approximately .4 mile on the access road and turn east (right) onto Mitchell Road. Then turn immediately north (left) onto FM 3513 (Village Creek Parkway). Go approximately 2 miles and turn East (right) on Alma Drive. Cross the railroad tracks (veer to the left) and go .5 mile to park entrance. Very confident. Not Verified. Updated 12/28/07. HUNTSVILLE S. P. [HUNV]: Swim in a roped-off area of Lake Raven - beautiful clear water lake in forested area adjacent to Sam Houston N. F.. There are alligators in the far reaches of this lake but there have not been reported problems with people. Do not swim at dusk or dawn. WEB SITE. Phone: 936-295-5644 . Camping. Fee. LAT, LON lat=30.6156, lon=-95.5341(source: web site) (accuracy: approximate) LINK TO GOOGLE MAP. From Beaumont, take I-45 north to Huntsville. The park is 6 miles southwest of Huntsville on Park Road 40. Very confident. Not Verified. Updated 12/28/07. 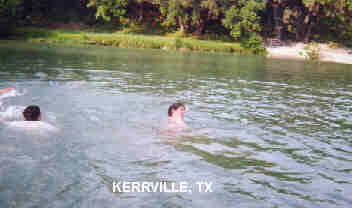 Many swimming places near Kerrville. See DIRECTIONS below for details. All directions are from Kerrville. 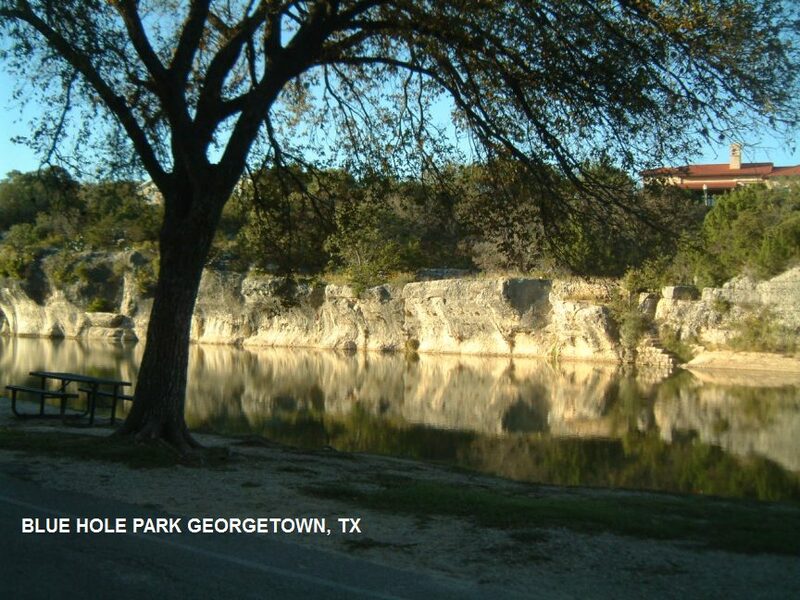 KERRVILLE [KERR]: NOTE: We had a report in summer 2014 that this park was closed for renovations. 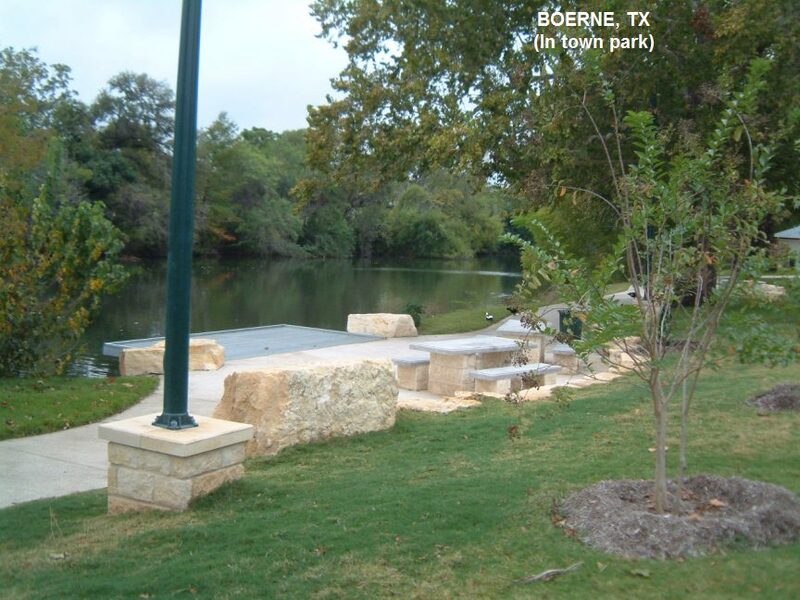 Downtown Kerrville has a park right along the Guadalupe River. There is hiking, picnicking and swimming in very deep water (good swimmers only) behind a dam here at the river right in the midst of town. To get there: From San Antonio, take I- 10 northwest to RT 16 then into Kerrville. Take RT 16 south in the downtown, cross the bridge over the river then take an immediate right into Louise L. Hays Park. LAT, LON : lat=30.04636, lon=-99.14297(source: DeLorme) (accuracy:exact) LINK TO GOOGLE MAP. 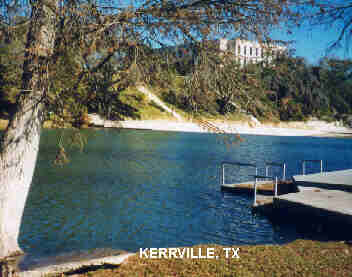 No camping at the site, for camping right near Kerrville, try the Kerrville-Schreiner S. P., just 3 miles from downtown, also along the Guadalupe River, with boat launching and swimming in the river. Has cabins also. To get to the camping place, take loop 534 just southeast of Kerrville. KERRVILLE PHOTO 1 - KERRVILLE PHOTO 2 Verified 11/2012. Very confident. Updated 11/2012. 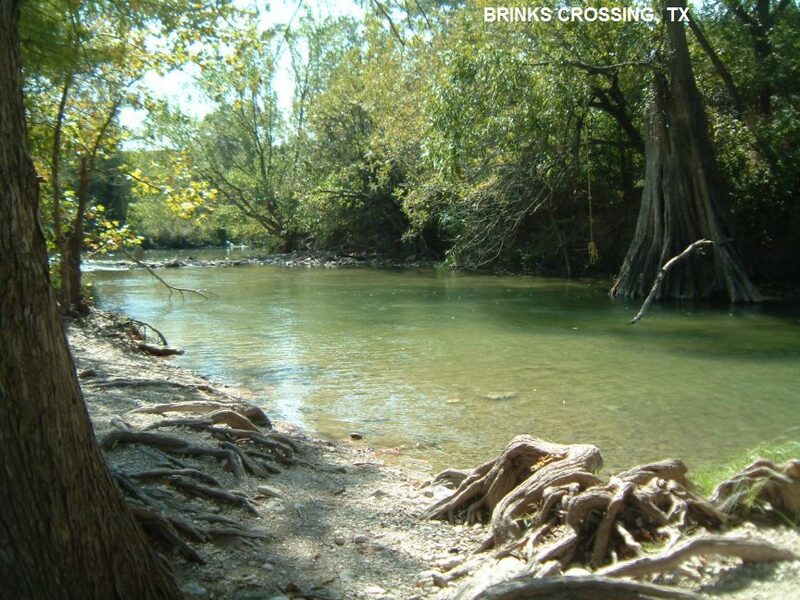 BRINKS CROSSING [BRIN]: Just southeast of Kerrville, a free swimming spot with trees and a sandy beach on the Guadalupe River. PHOTO . From Kerrville take RT 27 southeast (aka: Memorial Blvd., San Antonio Hwy). At the Kerrville Airport turn south (right) on Colvin Ranch Rd. E. then go right on Center Point River Rd.. The beach is right here where Cedar Point River Rd crosses the Gaudalupe River. Park and walk a very short way downstream (do not go past "no trespassing" signs) to where there is a swimming hole and rope swing on far side of creek. LAT, LON lat=29.95430, lon=-99.07913(source: measured ) (accuracy: exact) LINK TO GOOGLE MAP. Verified 11/2012. Very confident. Updated 11/2012. 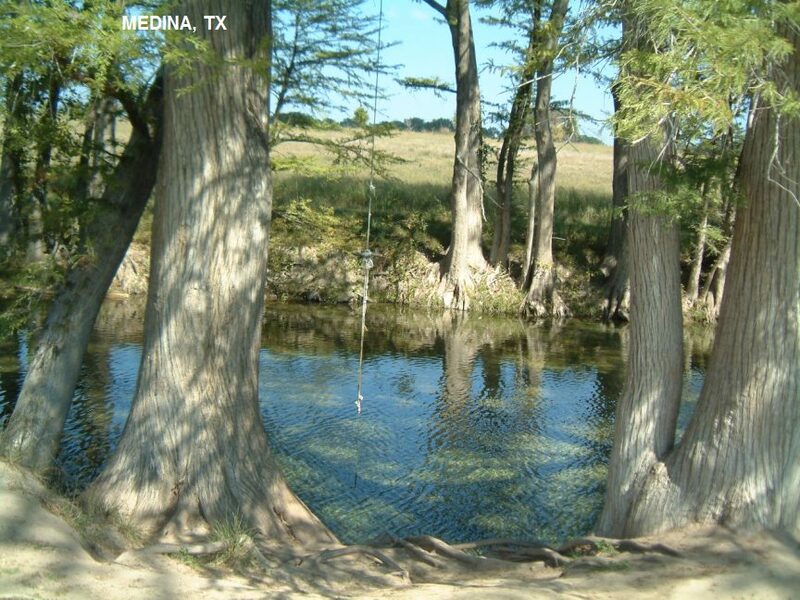 MEDINA [MEDI]: South of Kerrville, further south on RT 16, there is a roadside park and picnic area with a lovely tree-lined swimming hole and rope swing. PHOTO . From Kerrville take RT 16 south past Medina. 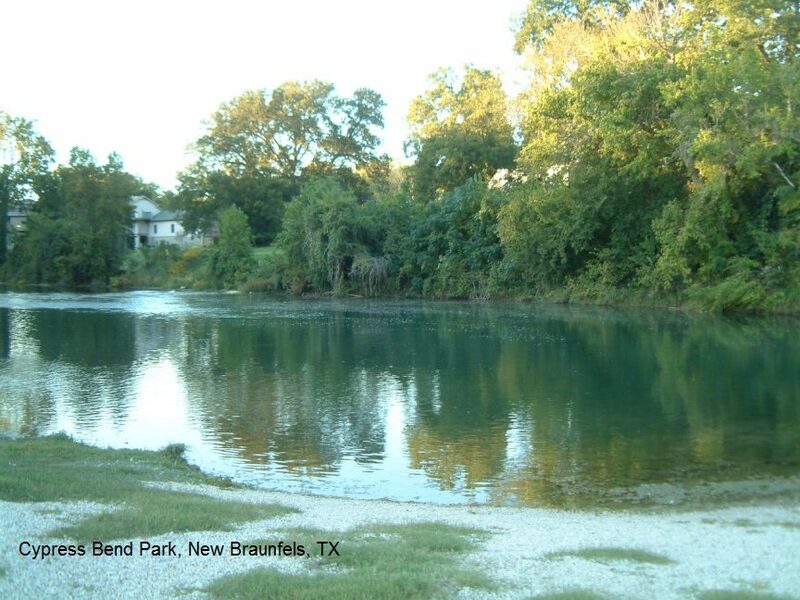 Swimming hole is in the roadside park just before you cross over the Medina River. LAT, LON lat=29.73614, lon=-99.12208(source: map) (accuracy: approximate) LINK TO GOOGLE MAP. Verified 11/2012. Very confident. Updated 11/2012. BANDERA CITY PARK [BAND]: Swimming, tubing and kayaking place on the Medina River in the city park in Bandera. To get here from Medina (above) continue south on RT 16 into Bandera. Where RT 16 turns east (left) in Bandera, keep going straight on Main St. a very short way then go west (right) on Maple St. (just before you cross the river) and the park is right there on your left by the river. LAT, LON lat=29.72287 lon=-99.0700(source: map) (accuracy: approximate) LINK TO GOOGLE MAP. Not verified. Pretty confident. Updated 12/2013. 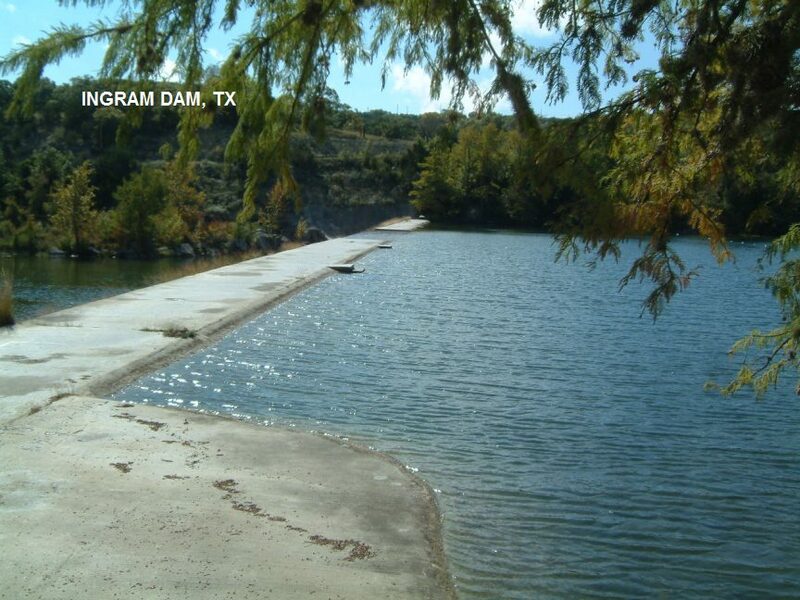 INGRAM DAM [INGR]: Swimming place in the Guadalupe River, upstream from Kerrville. The dam gets mossy and real slippery and folks slide down the dam face into the pond at the bottom. PHOTO , PHOTO . To get here, from Kerrville (above) take RT 27 west to Ingram. In Ingram, the dam is on your left on RT 27, you cannot miss it. But, there is NO LEGAL PARKING at the dam on either side of the road. If you go back (east) on RT 27 a short way, turn onto Cade Loop Rd. and there is parking for a couple of cars right there, an easy walk to the dam. There is a foot path through the fence to the dam with a sign that does not prohibit swimming. LAT, LON lat=30.0713, lon=-99.2561(source: measured) (accuracy: exact) LINK TO GOOGLE MAP. Verified 11/2012. Very confident. Updated 11/2012. 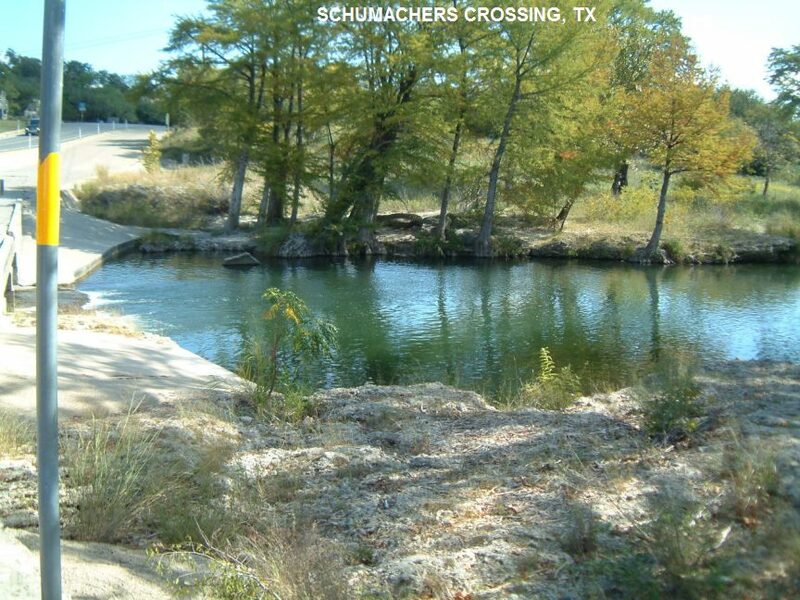 SCHUMACHERS CROSSING [SCHU]: Another swimming place in the Guadalupe River, upstream from Kerrville. Has waterfalls, roadside park and shallow or deep swimming. PHOTO . To get here, from Ingram (above) continue west on RT 39 toward Hunt. (You will be running alongside the Guadalupe River, mostly private property along here.) Before you come into Hunt, there is a bridge where RT 39 crosses the river (about where Cave Spring Rd goes off to the right) is a park with a broad, low dam and swimming places. LAT, LON lat= 30.067215, lon=-99.322007(source: measured) (accuracy: exact) LINK TO GOOGLE MAP. Verified 11/2012. Very confident. Updated 11/2012. 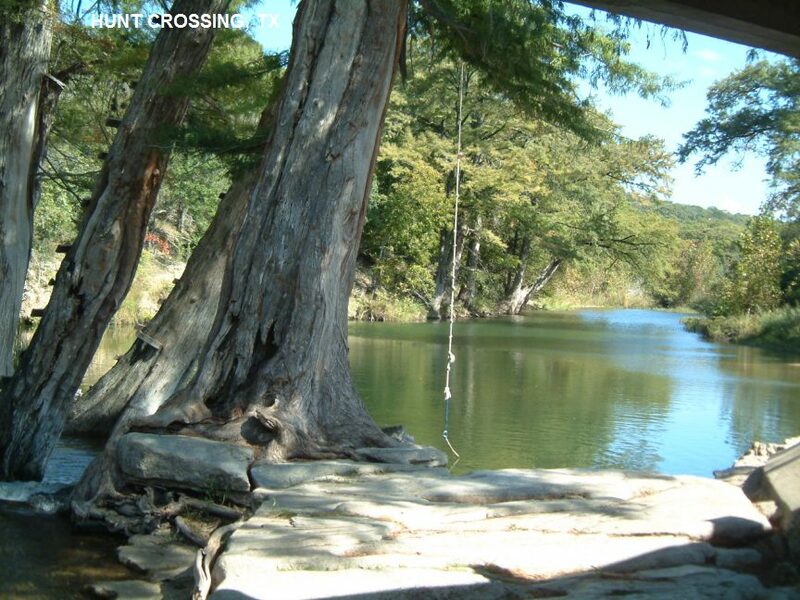 HUNT CROSSING [HUNT]: Another swimming place in the Guadalupe River, upstream from Kerrville. 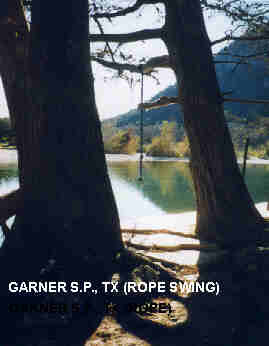 Has rope swing, county park and boat launch. PHOTO , To get here, from SCHUMACHERS CROSSING (above) continue west a very short way on RT 39 toward Hunt to where RT 39 crosses the river again (near the intersection of RT 39 and FM 1340) and below this bridge is the park and swimming place. If you walk UNDER the bridge, there is a nice, deep swimming holes with a rope swing. AT, LON lat=30.07, lon=-99.3322(source: map) (accuracy: approximate) LINK TO GOOGLE MAP. Verified 11/2012. Very confident. Updated 11/2012. 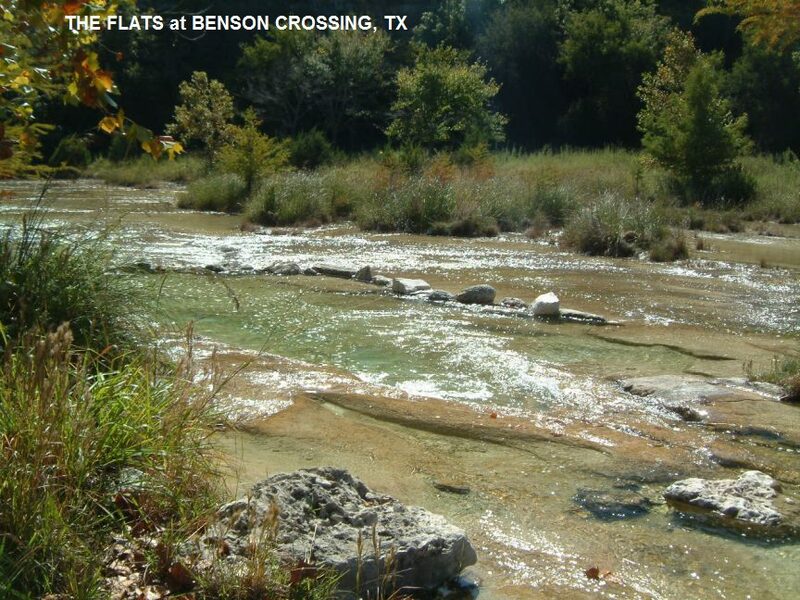 THE FLATS [FLAT]: Another swimming place in the Guadalupe River, at Benson Crossing, upstream from Kerrville. Not so popular as some of the others. Flat rocks underwater with grooves or tubs for sitting and cooling. Pretty much a water-play place, not deep enough to swim. PHOTO , To get here, continue west on FM 1340 to the sign for Bentson Crossing, park in the gravel pull-off. LAT, LON lat=30.0524, lon=-99.4507 (source: map) (accuracy: general area) LINK TO GOOGLE MAP. Verified 11/2012. Very confident. Updated 11/2012. 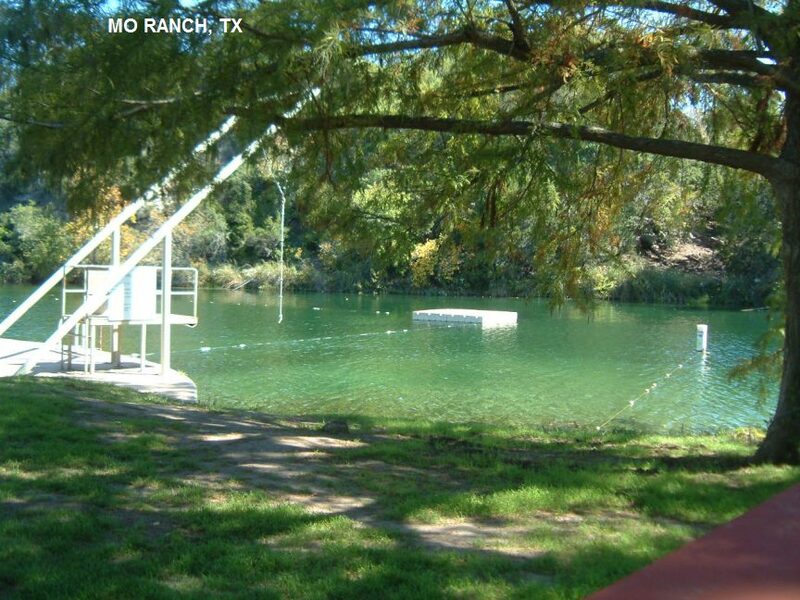 MO RANCH [MORA]: Another swimming place in the Guadalupe River, upstream from Kerrville. PHOTO , PHOTO , PHOTO . This from a fan in 2011: "You don't have to be a Presbyterian! Nor do you have to be part of a conference. And you don't have to stay at the facilities - there is a nominal ($10. per person) daily fee. I looked around on their website and found the answers to these and other questions at WEB SITE ". "As for the swimming hole: boy, do they! There is a large water area off the Guadeloupe river that they have dammed up, but that is just the beginning. Along that area (last time I was there), they have a rope swing, a platform and a sled thing that you climb up and slide down the track out and over the water. It's pretty old-fashioned but wild fun. There is still more. At the edge of the property, there is an area of "rapids" (as they call them)- really fissures in the rock of the river (which is clear and not very deep at most points, by the way). These natural formations in the rock form little "hot tubs" for the clear, warm water that is streaming by from the (very) nearby hot springs source. The water also cascades through some "chutes" that the kids love to slide through with the water. Very, very, very fun, I'd have to say. Canoes and boats are also available to row around at no extra charge." To get here, from THE FLATS (above) continue west on FM 1340 about 1.75 miles to signs. Go to the registration office and register for day use. Camping is also available. Address: 2229 FM 1340. Phone: 800-460-4401. LAT, LON lat=30.06070, lon=-99.47180(source: map) (accuracy: approximate) LINK TO GOOGLE MAP. Verified 11/2012. Very confident. Updated 11/2012. Picturesque small lake in town park (Wolf Creek Park). Bath houses, trading post (with meals), picnic tables. From From Perryton (up in the panhandle), go 12 miles south on RT 83 then 6 miles east on U Rd. Several swimming places near Llano and Burnet. See DIRECTIONS below for details. All directions are from Johnson City. 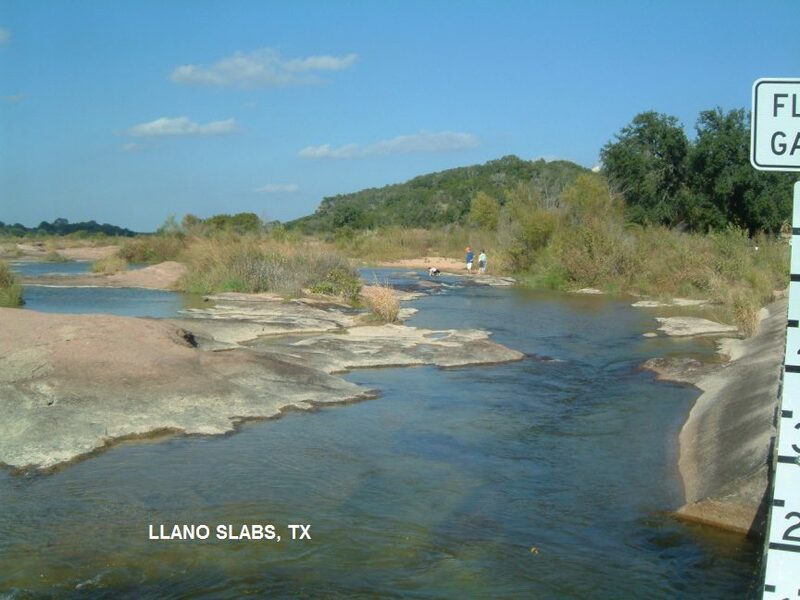 LLANO SLABS [LLAS]: Traditional swimming place on the Llano River in Kingsland. Here, the river is wide and mostly shallow with a few deep places to cool off in. PHOTO . If you go, TAKE YOUR TRASH OUT WITH YOU! To get here from Johnson City, take RT 281 north to Marble Falls then FM 1431 west (left turn) through downtown Kingsland then turn west (left) on Ranch 3404 and go to the Llano River where the swimming hole is. LAT, LON lat=30.68231, lon=-98.48369(source: measured) (accuracy: exact) LINK TO GOOGLE MAP. Verified, 11/2012. Very confident. Updated 11/2012. 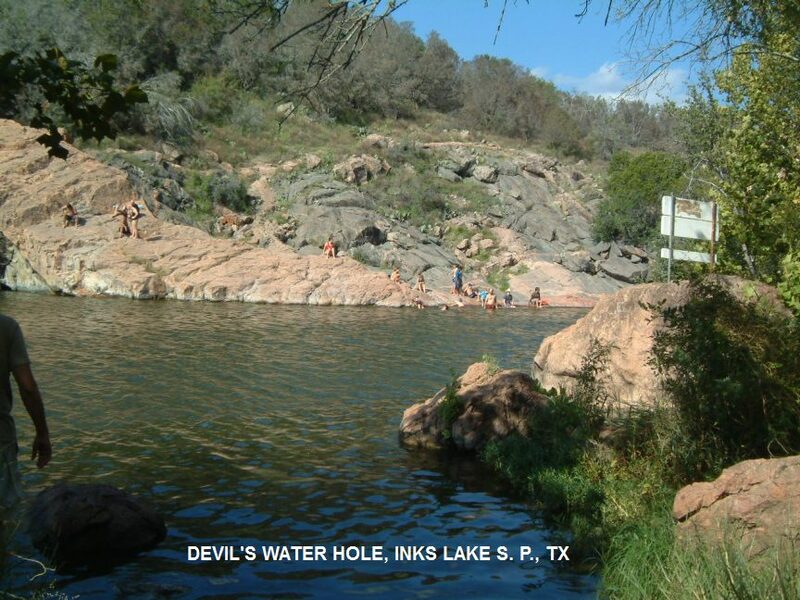 DEVILS WATER HOLE [DEVI] In Inks Lake S. P. near the campground, there is a deep, popular part of the dammed-up Colorado River where one might swim and jump into the deep water. PHOTO . Inks Lake S. P. . LAT, LON : lat=30.7322, lon=-98.3739(source: DeLorme) (accuracy:exact) LINK TO GOOGLE MAP. To get here from Johnson City, go north on RT 281 through Marble Falls to Burnet, then 9 miles west on RT 29 then 3 miles south on Park Road 4 to Ink Lake S. P.. Pay day use fee to enter, ask at the entrance for a map and ask where the Devil's Waterhole is. It is at the far end of the campground and there are signs along the road to the Devil's Waterhole. There is a parking area and a short trail (signed) to the water hole. (Keep your map for the drive back out through the campground, it is very easy to get lost in the campground .) Very confident. Verified, 11/2012. Updated 11/2012. 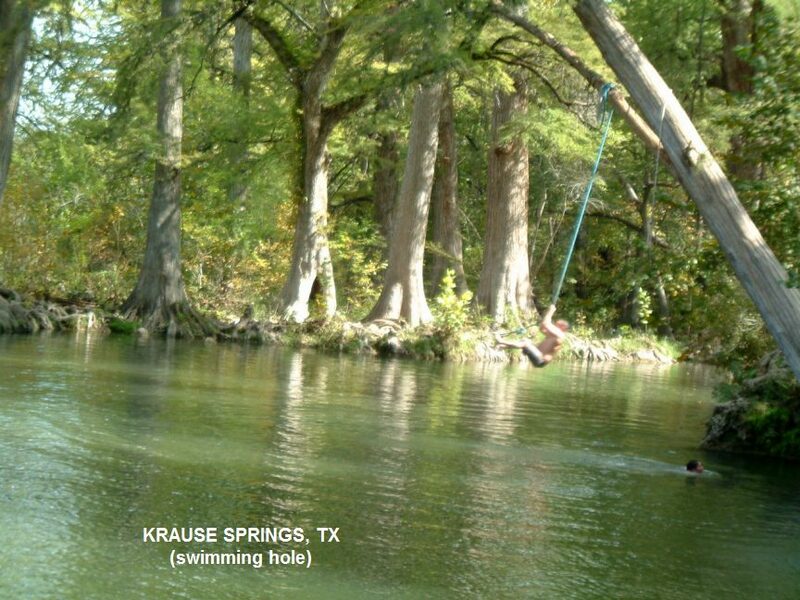 CASTELL CROSSING [CAST]: Traditional swimming and wading place on the Llano River west of Llano. No shade. To get here from Johnson City, take RT 281 north then RT 71 northwest (left) to Llano. From Llano, go west on RT 29 about 17 miles then turn south (left) on SR 2768 and go to Castell Crossing at the Llano River where the swimming hole is. LAT, LON lat=30.70454 lon=-98.9587 (source: map) (accuracy: approximate) LINK TO GOOGLE MAP. Not verified. Pretty confident. Updated 12/2013. 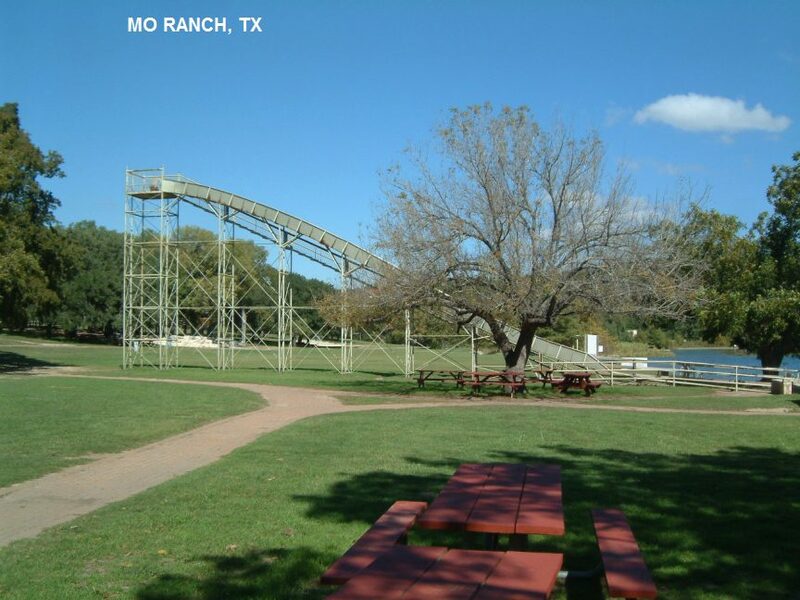 GRANITE BEACH PARK [GRAN]: A commercial waterpark on natural lake in Marble Falls on Lake LBJ (Colorado River), with lots of slides and water play. At Lake LBJ Yacht Club and Marina. Fee is charged. WEB SITE. 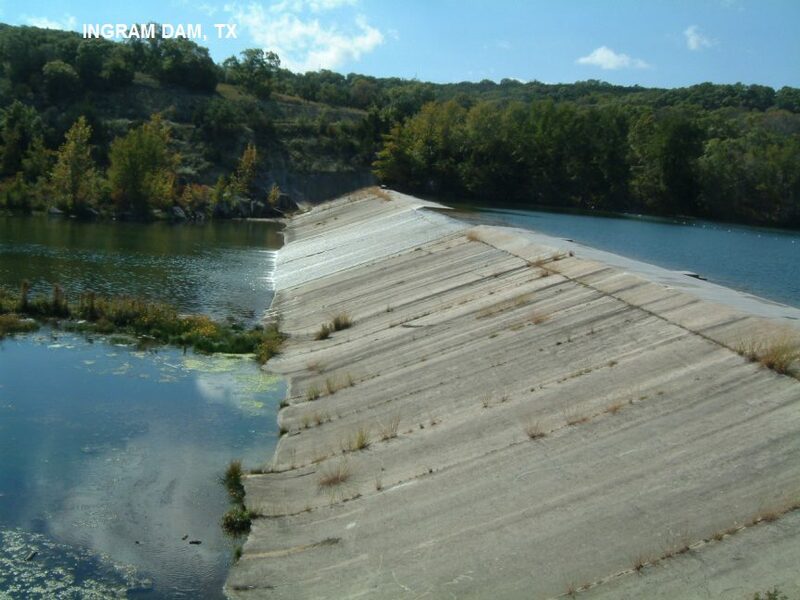 200 S. Wirtz Dam Road, Horseshoe Bay, Texas 78657 (Located off FM 2147 next to Horseshoe Bay in Marble Falls). Right at the dam on Lake LBJ. Phone: 830-693-9172 LAT, LON lat=30.55177 lon=-98.335 (source: map) (accuracy: approximate) LINK TO GOOGLE MAP. Not verified. Very confident. Updated 11/2014. 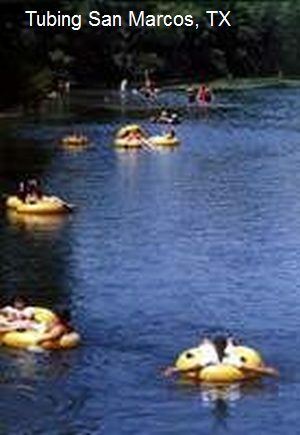 Two swimming, canoeing, tubing places near Luling, close to I-10 east of San Antonio. See DIRECTIONS below for details. ZEDLER MILL [ZEDL]: Unofficial, traditional swimming place with rope swing on San Marcos river beside historic Zedler Mill , You Tube Video . Phone 512-227-1724. To get here continue on RT 80 north, cross the river, then turn west (left) on Laurel Ave.. The mill and swimming place are very near here. LAT, LON lat=29.66728, lon=-97.65044(source: map) (accuracy: approximate) LINK TO GOOGLE MAP. Not verified. Pretty confident. Updated 11/2012. RIVER TRAIL PARK [RIVT]: Park that is upstream of Zedler Mill on the San Marcos river near Luling. 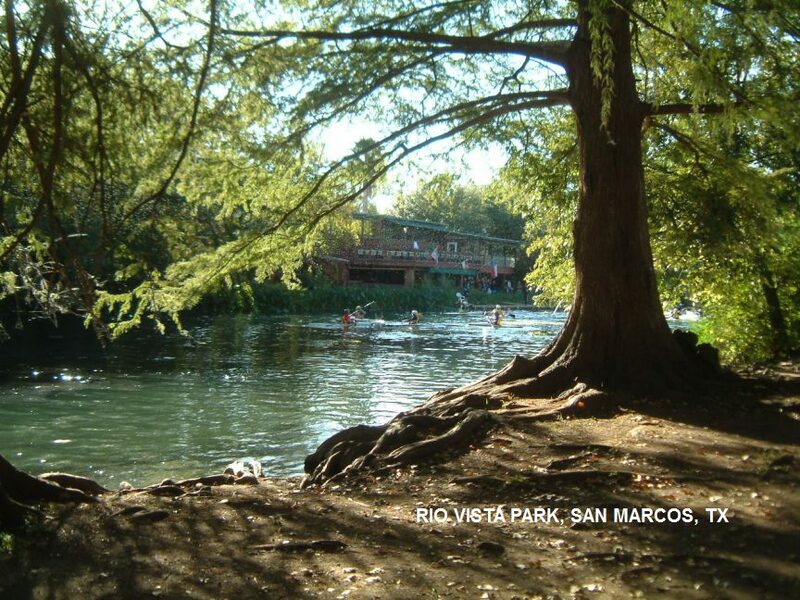 It is a put-in place for canoeing on the San Marcos (Zedler Mill is the take-out place) and a swimming place as well. To get here continue on RT 80 north to downtown Luling then go west (left) on RT 90 (Pierce St.) about 3.25 miles (just before you cross the river) and the park is on your left. The address of the park is 100 Paddling Trail Rd, Hwy 90 West, Luling, TX. The swimming place is in this park. LAT, LON lat=29.66805, lon=-97.69952(source: map) (accuracy: approximate) LINK TO GOOGLE MAP. Not verified. Pretty confident. Updated 11/2012. 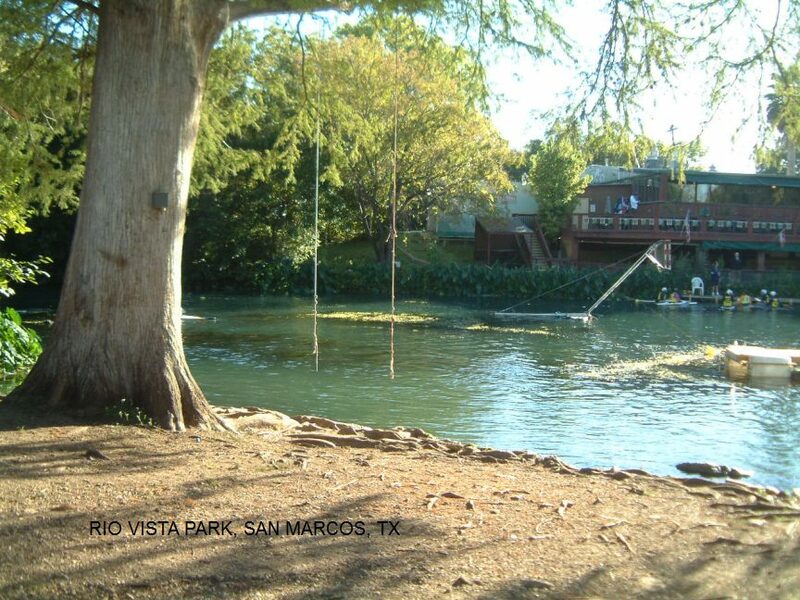 LEISURE CAMP [LEIS]: Swimming and tubing at a (privately operated) campground on the San Marcos River. Camping and day use for a fee. See their WEB SITE . Phone: (512) 488-2563. To get here from downtown Luling go west (left) on RT 80 (Austin St., becomes San Marcos Hwy.) and go about 9 miles to the Fentess area. Just before Fentess, turn south (left) on S. Main St. (RT 125) then left again on River Lane and continue a short way to Leisure Camp at the San Marcos River. LAT, LON lat=29.74766, lon=-97.77587(source: map) (accuracy: approximate) LINK TO GOOGLE MAP. Not verified. Pretty confident. Updated 12/2013. 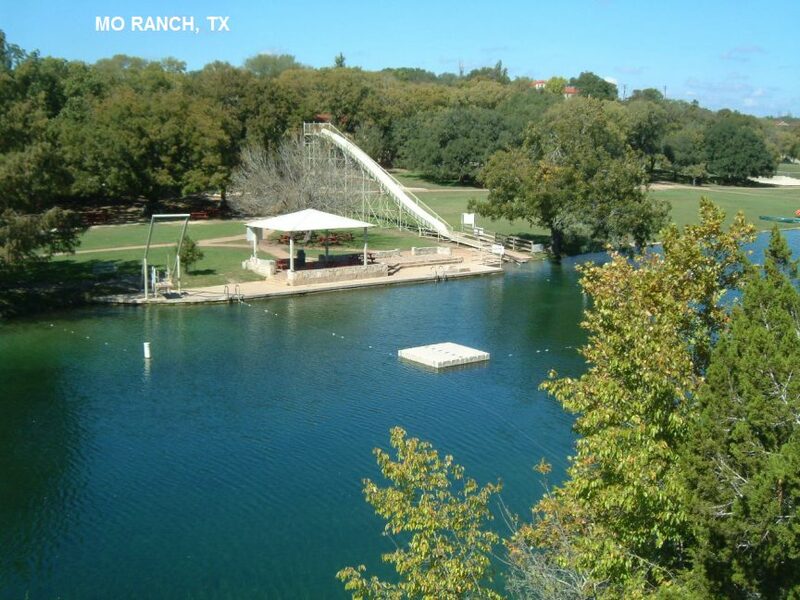 A traditional German town, at the junction of the Comal River and the Guadalupe River, with lots of water tubing and water park activities and other tourist attractions. Many commercial, with a fee, but some free as well. Some of the commercial parks and outfitters are: Schlitterbahn Water Park, Rio Rafting, River Sports Tubes. For some free public access points see DIRECTIONS below. 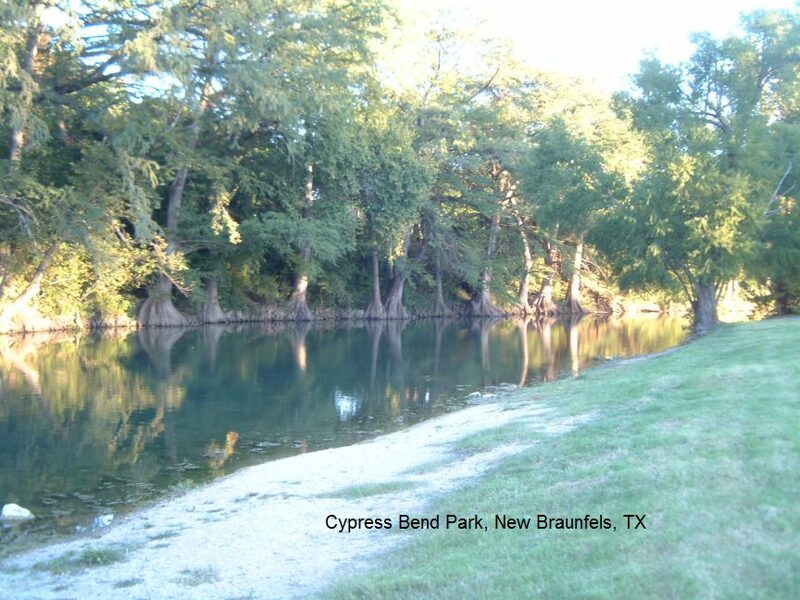 CYPRESS BEND PARK [CYPR] Swimming place in Guadalupe River in public park. PHOTO , PHOTO . To get here from the downtown New Braunfels intersection of W. San Antonio St. and Landa St. (above), take S. San Antonio St. northeast then left on Union Ave for a short way then right on Common St. then right on Peace Ave (just before you cross the river) then left into Cypress Bend Park and the swimming place. LAT, LON : lat=29.7130, lon=-98.1062(source: measured) (accuracy:exact) LINK TO GOOGLE MAP. Very confident. Verified 11/2012. Updated 11/2012. 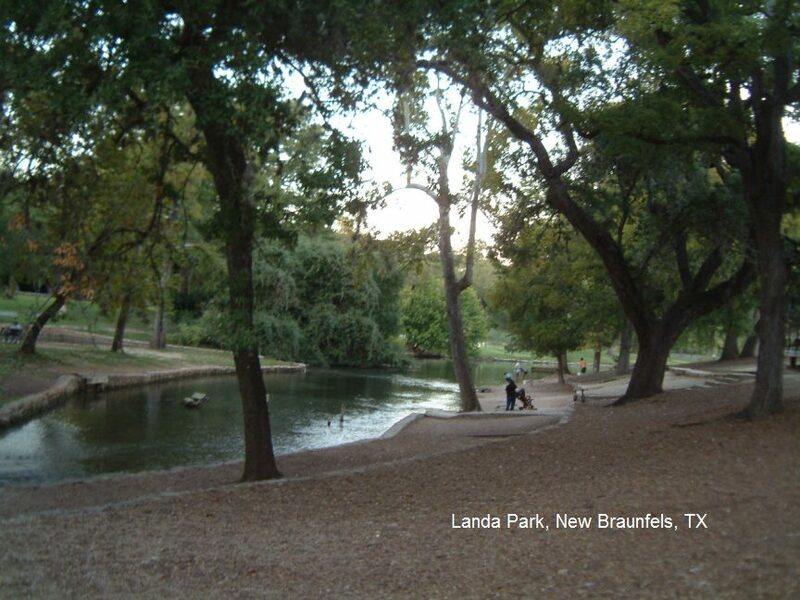 LANDA PARK [LAND] Wading place in Comal Springs in downtown public park. Not deep enough to swim but very pretty and historic springs. PHOTO , PHOTO , PHOTO . To get here from the downtown New Braunfels intersection of W. San Antonio St. and Landa St. (above), take Landa St. west then right on Landa Park Dr. into Landa Park. 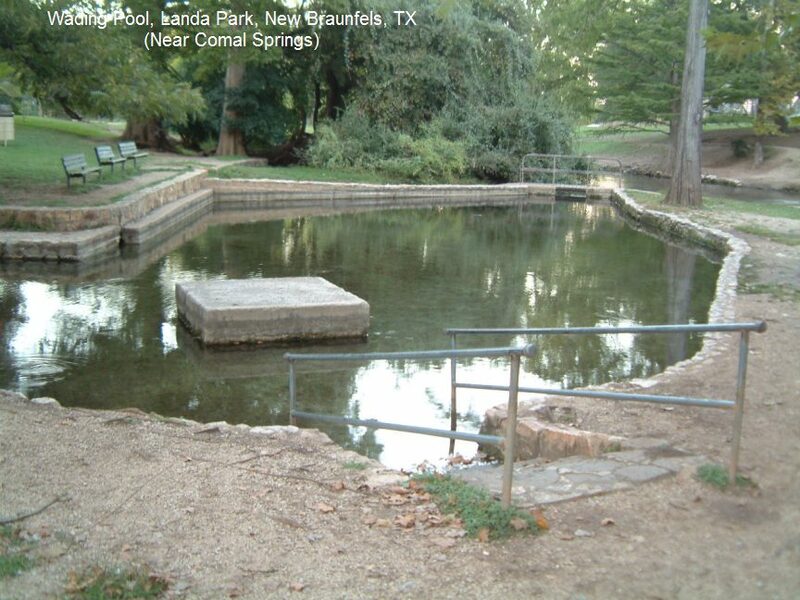 Continue on Landa Park Dr. to the Comal Spring and the wading pool (there is a sign) just downstream from the spring. LAT, LON : lat=29.7107, lon=-98.1353(source: measured) (accuracy:exact) LINK TO GOOGLE MAP Very confident. Verified 11/2012. Updated 11/2012. PRINCE SOLMS PARK [PRIS] Also known for the "City Tube Chute". 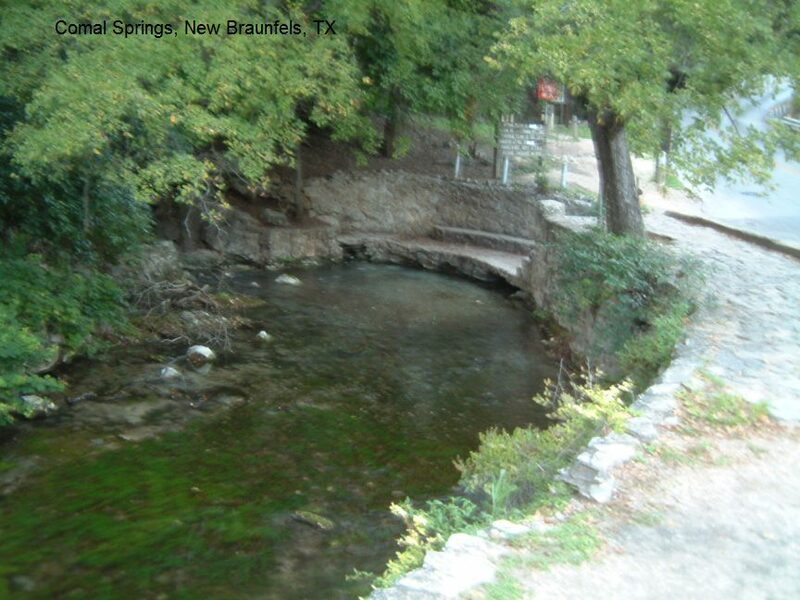 Attractive, small park on the Comal River in New Braunfels. WEB INFO . Phone:830 608-2165. Swimming and tubing down the famous "chute" (fee) - tube rentals nearby. To get here from the downtown New Braunfels intersection of W. San Antonio St. and Landa St. (above), San Antonia St. northeast across the Comal River then turn northwest (left) on S. Liberty St. and very shortly turn left again on Liebscher Dr.. The river, park and chute are here, at 100 Leibscher Drive. LAT, LON : lat=29.70779, lon=-98.1353(source: map) (accuracy:approximate) LINK TO GOOGLE MAP Pretty confident. Not verified. Updated 11/2014. CAMP HUACO SPRINGS [CAMH] Swimming and tubing at a very nice (privately operated) and popular (get there early) campground on the Guadalupe River. Camping and day use for a fee. See their WEB SITE . To get here from the downtown New Braunfels intersection of W. San Antonio St. and Landa St. (above), take S. San Antonio St. northeast then left on Union Ave. Continue on Union Ave about 10 blocks then turn northeast (right) on Klingemann ST. and continue as it turns into River Road. Stay on River Rd. as it leaves town and turns to the right (do not go straight onto Heuco Springs Loop Rd) to join up with the Guadalupe River (about 4 miles from Union St.) and you will shortly see Camp Huaco Springs on the right. LAT, LON : lat=29.76042 lon=-98.13997(source: map) (accuracy:approximate) LINK TO GOOGLE MAP Very confident. Not verified. Updated 12/2013. 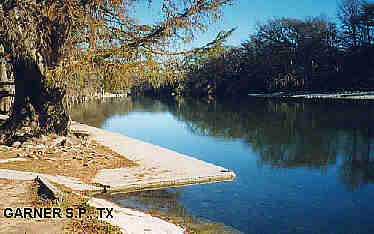 GUADALUPE RIVER S. P.[GUAR] Four miles of the beautiful Guadalupe River to play and swim in this very popular state park. PARK WEB SITE. Some remote places to access the river are also possible in this park if you look. Camping at the park and all facilities here also. To get here from the downtown New Braunfels intersection of W. San Antonio St. and Landa St. (above), take Landa St. (RT 46) west then turn north (right) to stay on RT 46 (becomes Walnut Ave.). Go about 25 miles west on RT 46 then look for signs to Guadalupe S. P. and turn north (right) on State Park Rd. LAT, LON : lat=29.85226 lon=-98.5082(source: map) (accuracy:approximate) LINK TO GOOGLE MAP. Pretty confident. Not verified. Updated 12/2013. Also, very near here is Nichols Landing County Park which has access to the Guadalupe River for swimming and wading as well. To get here, going west on RT 46, BEFORE you get to State Park Rd. turn north (right) on Spring Branch Rd. and go about 7 miles then, just after you cross over the river, turn immediately right on Old Spring Branch Rd. and go a short way to Nichols Landing County Park on the river. 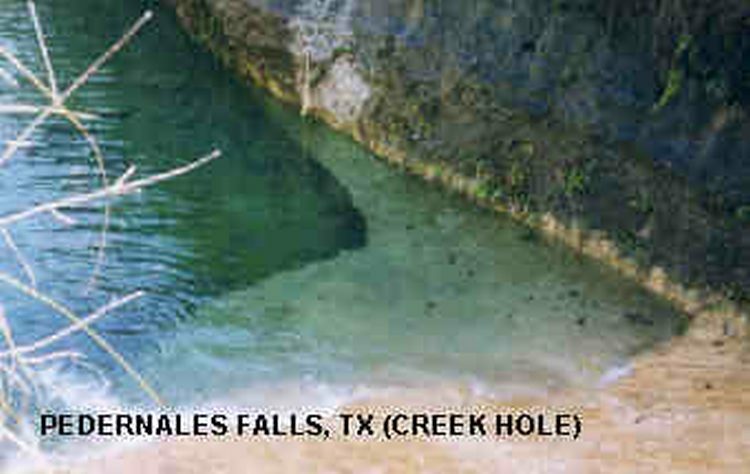 Several swimming places near Pedernales Falls, west of Austin. See DIRECTIONS below for details. For a very secluded little swimming place here, there is a trail to "primitive camping", a nice easy wide trail. On this trail, at about 3/4 mile (pass the .5 mile sign, right at the 6.5 mile sign in opposite direction) off to the left of the trail is a creek with a little ravine and nice cozy secluded deep pools at the bottom good for swimming. Mountain biking is popular on this trail, you can also primitive camp back in there. PEDERNALES FALLS S.P. - CREEK HOLE PHOTO Verified. Very confident. Small swimming lake in National Forest Rec Area. Family fun - No lifeguards. Unknown if there is a fee. From Nacogdoches, go southwest on RT 7 about 35 miles (through Pollock) to Ratcliff. Go about 1 mile further on RT 7 to signs for the Ratcliff Rec Area in the Davy Crockett National Forest. 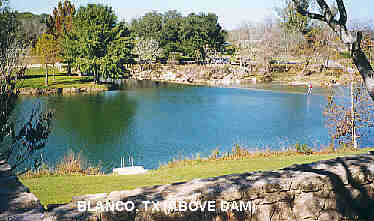 Spring-fed pool in Horseshoe City Park in Del Rio. Link to photos and information. Unknown if there is a fee. From San Antonio, take RT 90 west to the Mexico border, about 160 miles, to Del Rio. No more detailed directions. Several swimming places in and near San Marcos, south of Austin. See DIRECTIONS below for details. All directions are from I-35 at San Marcos. 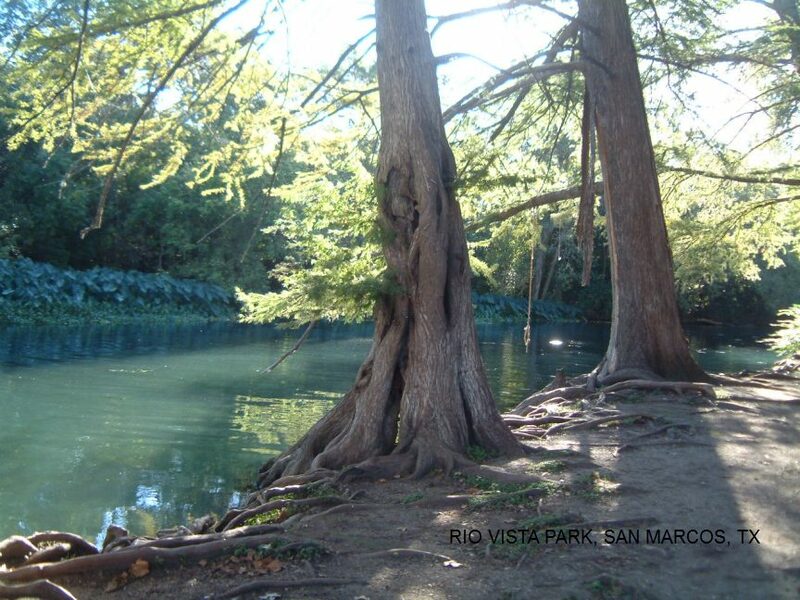 RIO VISTA PARK [RIOV]: Beautiful, deep spring-fed swimming hole in the San Marcos River, crystal clear water, with rope swing under trees in park very near I-35. Great family road trip cooling off place (for swimmers only). PHOTO , PHOTO , PHOTO . To get here from I-35 at San Marcos, take S. Guadalupe St. north toward downtown then turn east (right) onto Cheatham St. and continue, following the signs to Rio Vista Park. LAT, LON lat=29.8787, lon=-97.9333(source: measured) (accuracy: exact) LINK TO GOOGLE MAP.Very confident. Verified 11/2012. Updated 11/2012. 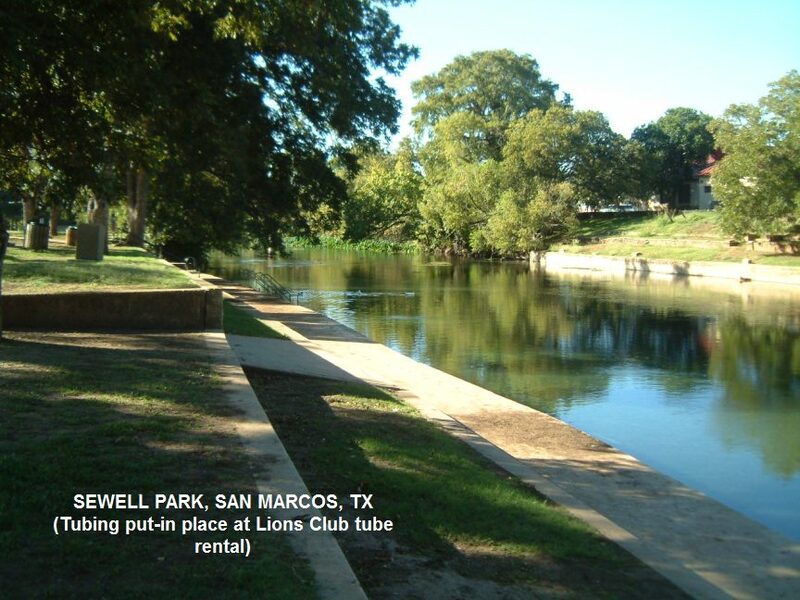 SEWELL PARK [SEWE]: For a great family tubing trip on the San Marcos River, begin at Sewell Park and end at Rio Vista Park (above). The Lions Club has a huge tube rental place in Sewell Park right by the put-in for the river. Another great family trip if you have a bit more time. PHOTO , PHOTO . To get here from I-35 at San Marcos, take S. Guadalupe St. north to downtown then turn east (right) onto University Dr.. (Ignore any signs to Sewell Park - it is a big park and the tubing place is in a rather obscure part of it - our coordinates should get you there with your gps or use these directions very carefully or ask somebody). Bear left to stay on University Dr. then it crosses the river and becomes Aquarena Springs Dr.. (This is the campus of Texas State University). Continue a short way on Aquarena and turn southeast (right) onto Charles Austin Dr. then turn right onto City Park St. and follow it to the river and the Lions Club Tube Rental (big sign). (Ask how long it is to tube to Rio Vista park - depends on water level.) LAT, LON lat=29.8868, lon=-97.9349(source: measured) (accuracy: exact) LINK TO GOOGLE MAP.Very confident. Verified 11/2012. Updated 11/2012. 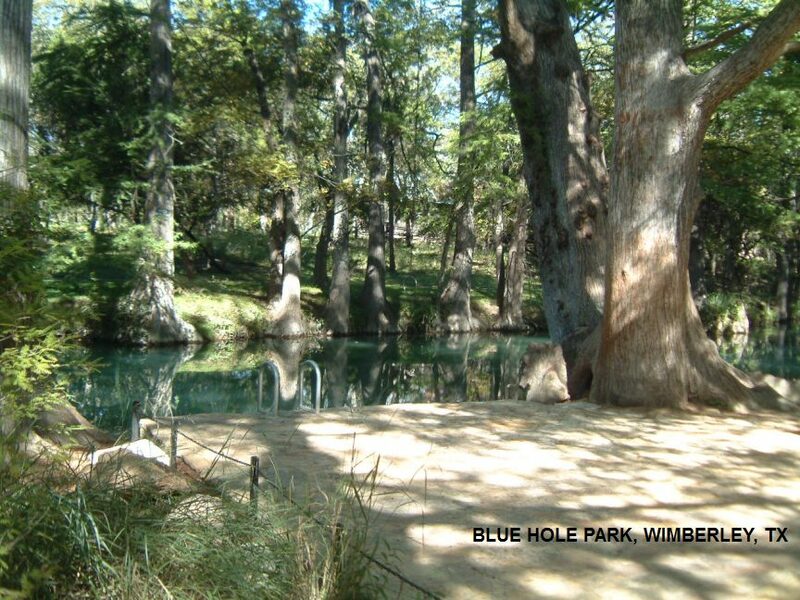 BLUE HOLE WIMBERLEY [BLUW]: A multi-generation local treasure (and preserved as such), the Blue Hole at Wimberley has recently re-opened as a regional park. Blue-green Cypress Creek flows under Cypress trees through a naturally beautiful, shaded area with swimming and a rope swing. A shrine to the old swimmin' hole. PHOTO , PHOTO , PHOTO . Many renovations have been done to the park, including a new changing facility and a new boardwalk to access the rope swing. There is a fee to swim. Web Site . To get here, from I-35 at San Marcos take Ranch 12 northwest to Wimberley. In downtown Wimberley, where you see "Taste Buds" sign on the right, take a right onto Old Kyle Rd. (not signed). Continue on Old Kyle Rd. then turn left on Blue Hole Lane to the Blue Hole Park. LAT, LON lat=30.0006, lon=-98.09005(source: measured) (accuracy: exact) LINK TO GOOGLE MAP. Verified, 11/2012. Very confident. Updated 11/2012. Follow these directions carefully and use your GPS if you can, it can be confusing. 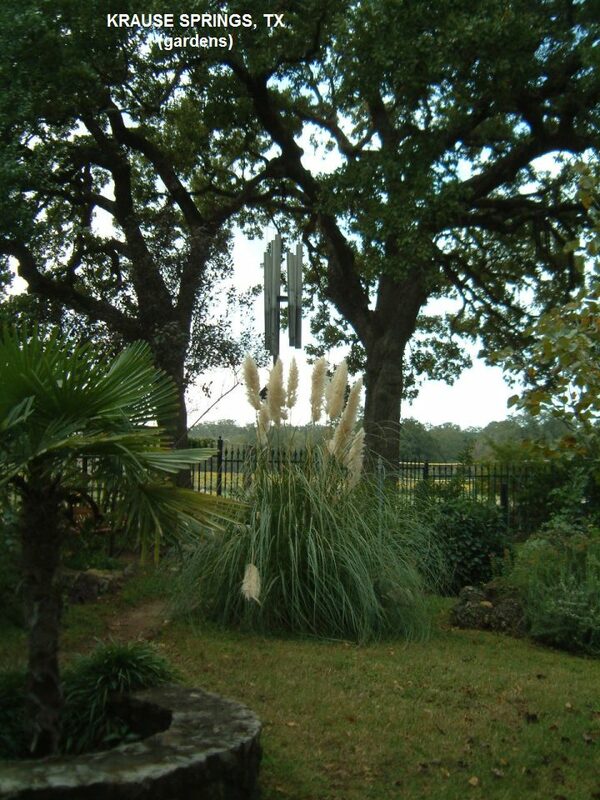 From Wimberley, take RT 12 north about 4 miles then turn west (left) on Jacob�s Well Rd (RT 182). Follow Jacobs Well Rd. about 2 miles (becomes RT 220) then turn north (right) on Pleasant Valley Rd. Go about .25 miles on Pleasant Valley Rd then jog right then left onto Woodacre Dr.. Stay on Woodacre Dr as it bends right (becomes Acacia Dr) and you will shortly come to the Jacob�s Well Natural Area. The address is said to be 221 Woodacre Drive (also known as Acacia Drive). LAT, LON lat=30.03594, lon=-98.12915(source: map) (accuracy: approximate) LINK TO GOOGLE MAP.Very confident. Not verified. Updated 9/2014. FIVE MILE DAM PARK [FIVM]: Better get here early in the Spring to find enough water to swim. Swim upstream of the dam, water play below the dam. To get here from San Marcos, take Aquarena Springs Dr. north and bear left onto RT 140 and go about 4 miles, cross the Blanco River, then turn immediately west (left) on S. Old Stagecoach Rd. and enter Five Mile Dam County Park. LAT, LON lat=29.94274 lon=-97.899(source: map) (accuracy: approximate) LINK TO GOOGLE MAP.Very confident. Not verified. Updated 12/2013. Long-time, historical spring-fed swimming hole, now part of a privately owned park and campground. 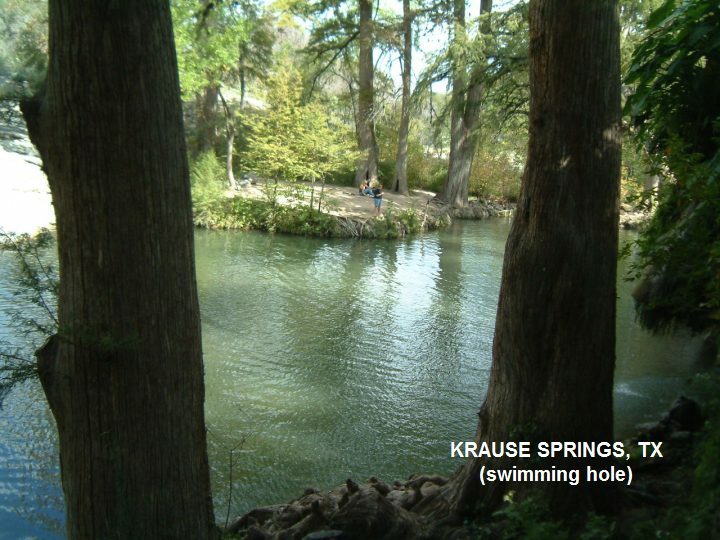 The swimming hole, which is 68 degrees year round (similar to Barton Springs, in Austin) has been drawing outdoor enthusiasts for decades to its cool water and flowing creeks. Great family fun place, you can swim even if you dont camp, for a small fee. PARK WEB SITE . From Nacogdoches, go north on RT 259 then go east on CR 1087 for 4.5 miles then turn right (south) on CR 153 to the entrance about 100 yards. Long-time local swimming place with beautiful aquamarine spring water, sandy beach. Jumping platform, snack bar, porta-pottis. Snack bar, picnic pavilion, porta-pottis. From Fort Worth, head northwest on RT 199 for about 50 miles. Turn left onto Shawver Rd. then jog left and right to stay on Shawver Rd. Turn left onto Elenburg Rd. and the address is 2479 Elenburg Road, Perrin, TX. 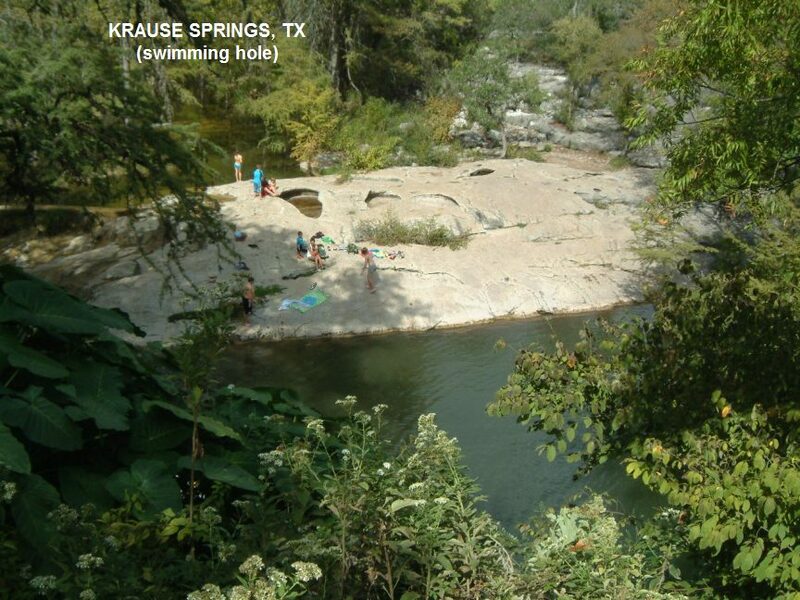 Several swimming place on the clear, cool Frio River on the western edge of the Hill Country. For details, see DIRECTIONS below. 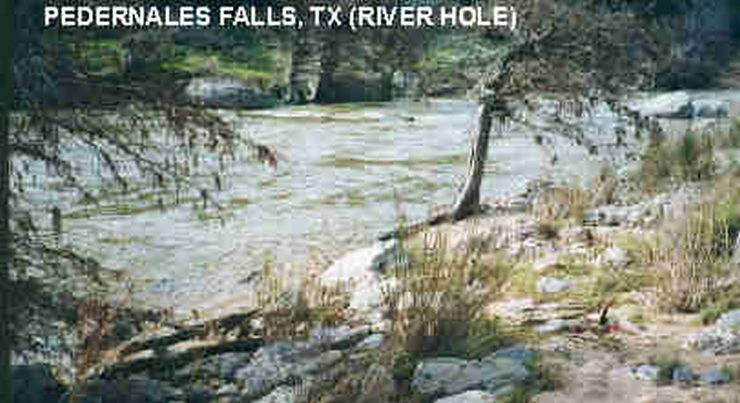 NEALS LODGES [NEAL]: Swimming place in clear, cool Frio River, on property of Neal's Lodges. Fee. Tube rentals at Neals, cabins and camping. From Uvalde go north on RT 83 to Concan. As you approach Concan, turn east (right) on RT 127 and come to Neal's Lodges before you cross the river. The address is 20970 Hwy 127, Concan, TX, 78838. LAT, LON 29.4953, -99.7139(source: map) (accuracy: approximate) LINK TO GOOGLE MAP. Very confident. Not verified. Updated 12/2013. GARNER S. P. [GARN]: On a beautiful stretch of the Frio River, Garner S.P. has family camping, swimming and fun for all ages. PHOTO , PHOTO. The swimming area has a concrete "dock" for jumping and sunning and a rope swing hangs invitingly from a nearby tree over the water. web site. To get here from Neals Lodges (above) go a short way north on RT 83 and look for park signs. LAT, LON lat=29.583, lon=-99.739(source: map) (accuracy: approximate) LINK TO GOOGLE MAP. Also, on RT 350 (Old Leakey Rd. ), which runs along the east boundary of the park, are several private campgrounds that are right on the Frio River as well and have swimming, tubing and water play as well. Very confident. Not verified. Updated 12/2013. UTOPIA CITY PARK [UTOP]: Park and swimming hole in the Sabinal River. Can be busy on warm weekends. To get here from Garner S. P. (above) go east about on RT 1050 about 15 miles to Utopia. The park and swimming hole are on your left as you enter Utopia (just after you cross the Sabinal River). LAT, LON 29.61514,-99.53008(source: map) (accuracy: approximate) LINK TO GOOGLE MAP. Very confident. Not verified. Updated 11/2014. WES COOKSEY PARK [WESC]: Swimming place in county park on the spring-fed Neuces River. Swim upstream of dam, wade downstream. From Uvalde go northwest on RT 55 (along the Neuces River) about 30 miles to just after RT 55 crosses the Neuces River (for the 2nd time) look for a sign to Wes Cooksey County Park right by RT 55. LAT, LON 29.62016, -100.00894(source: map) (accuracy: approximate) LINK TO GOOGLE MAP. Very confident. Not verified. Updated 12/2013. THE QUINCE [QUIN]: Roadside swimming hole in the Neuces River. YOUTUBE . Very deep, just park and swim, no facilities. To get here from Cooksey Park (above) go northwest on RT 55 about 5 miles to Camp Wood. Here, turn west (left) on E. 7th St. then left on River Rd.. The swimming place is here in the Neuces River. LAT, LON 29.66928,-100.02146(source: map) (accuracy: approximate) LINK TO GOOGLE MAP. Very confident. Not verified. Updated 11/2014. Outstanding cliff-jumping place, see video above. Not sure if there is a more gradual way to enter and exit for swimming. WEB SITE . All facilities at campground nearby, none at cliffs. From Waco, take N 19th St., (becomes China Spring Rd., becomes RT 1637) about 6 miles then turn northwest onto Wortham Bend Rd (right) (RT 2490) and go about 16 miles then turn right onto RT 56. You will turn left then left then right to STAY ON RT 56 for about 8 miles. Then turn right onto RT 2841 and go about 3 miles to Lake Whitney. The cliffs are very near here - dont know exactly.